Sharing Love for Fresh Seafood: How do you like your smoked salmon? How do you like your smoked salmon? Great in a salad, wrap, omelette, frittata, quiche or try it combined with goat cheese for that perfect toast. Whatever the combination, smoked salmon is a versatile ingredient that's easy to cook with. Quick and non-fussy dinner? 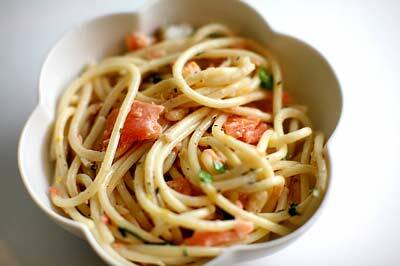 Try Smoked Salmon Pasta. What we love about this recipe, other than the ingredients (smoked salmon, pine nuts, yum!) is that it can be pulled together so quickly and it's not particularly heavy, as so many cream sauce pastas can be. There's also room for maneuvering; add more or less wine or cream to taste; leave out the pine nuts if you can't be bothered; add some asparagus or cream cheese if you want; use smoked trout or sturgeon instead of the salmon. The essentials are smoked fish, lemon, garlic, and pasta with some olive oil, wine, and or cream binding them together. 1 Heat to boiling a large pot with at least 4 quarts of water in it. While the water is heating, brown the pine nuts. Put the pine nuts in a single layer in a large skillet. Heat on medium heat, stirring occasionally, until fragrant and lightly browned. Remove pine nuts from pan and set aside. 2 Once the water is boiling, salt it with 1 Tbsp of salt for every 4 quarts of water. Once the water returns to a boil add the pasta to the pot. Leave uncovered, on high heat and let cook with a vigorous boil. Put the timer on for 8-10 minutes, or whatever your pasta package says is appropriate for al dente (cooked but still a little firm). 3 While the pasta is cooking, prepare the sauce. In a large skillet heat olive oil on medium heat. Add the shallots and garlic, cook for 2 minutes, then add white wine, lemon juice, and 1 Tbsp of lemon zest. Increase the heat and let boil down by half. If you want a slightly creamy sauce, add the cream and let boil a minute more. 4 Once the pasta is done, and before draining the pasta, scoop out one cup of the pasta cooking liquid and reserve. Drain the pasta and add it to the skillet with the sauce. Add back some of the pasta cooking liquid to the pasta if it is a little dry. Add the smoked salmon, toasted pine nuts, parsley, and the remaining lemon zest. Season with freshly ground black pepper.